Sadly, my spanish speaking abilities go as far as visiting google translate and hitting enter despite my two years of studying it in high school. I remember really liking the word sweater. Suéter– it just rolls off your tongue so easily. My college roommate (with whom I also took spanish with in HS) and I always thought we sounded really authentic when we said “?Donde Esta Mi Sueter?” or inserted any other clothing or food item we knew. Pantalones is a good one. Oh and nachos. 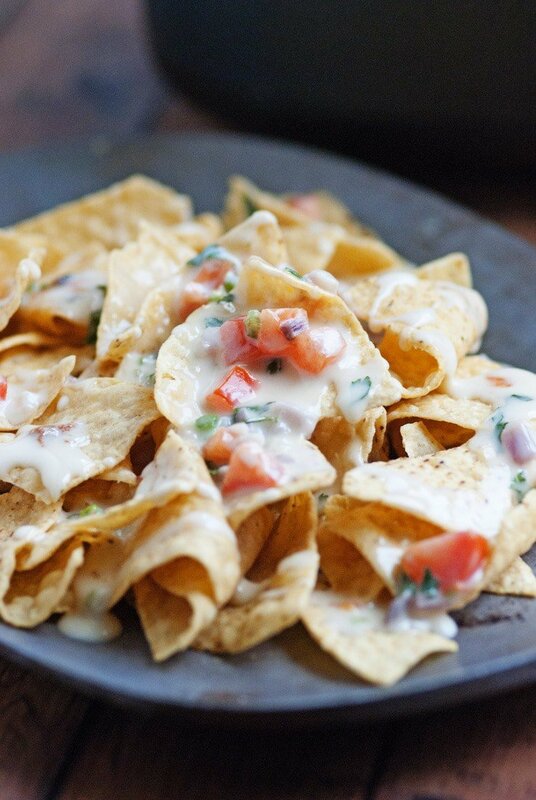 you can’t go wrong with nachos. 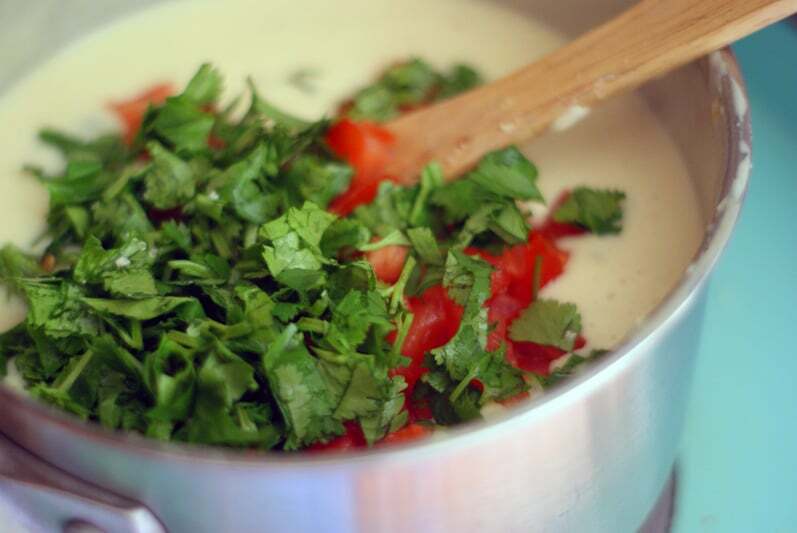 Speaking of nachos, have you ever had Queso Blanco at a restaurant? It’s crazy good. It’s also crazy easy to make. 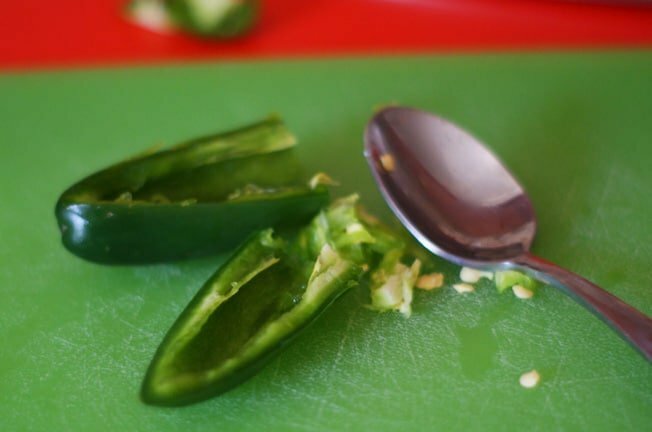 You’ll need to seed and vein your jalepeno if you don’t want it to be too spicy. I like to use a spoon to scrape the insides out. Just make sure that if you end up touching the seeds that you don’t rub your eyes or touch your face. Because oooh mama, it burns. Trust me on this one. 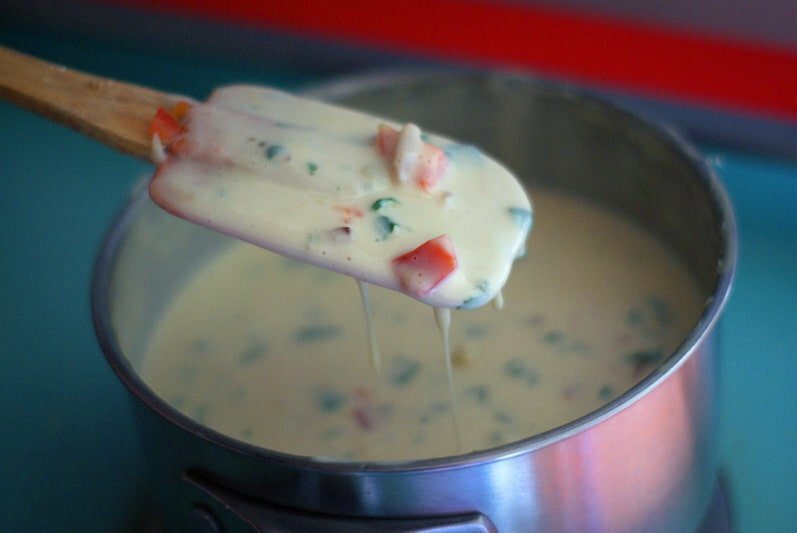 Pin This Recipe To Your Dip Board! 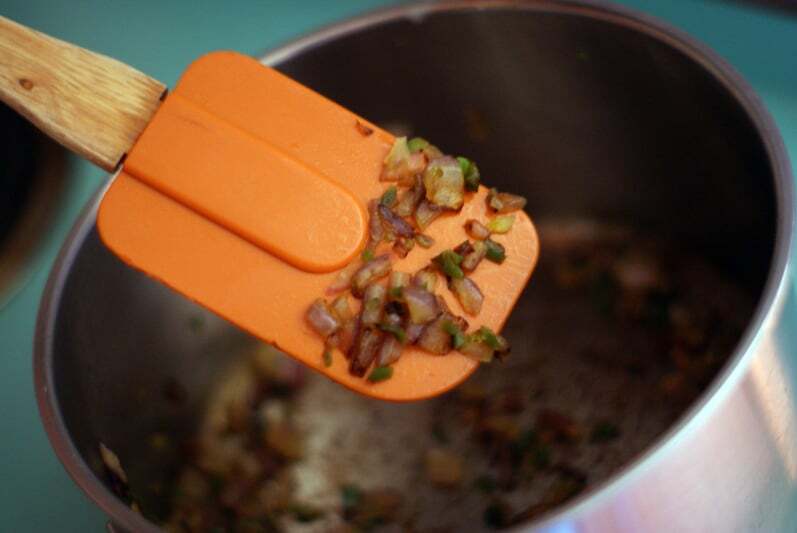 Give your jalepeno and onion a good chop chop. They don’t have to be super minced, just not super chunky. 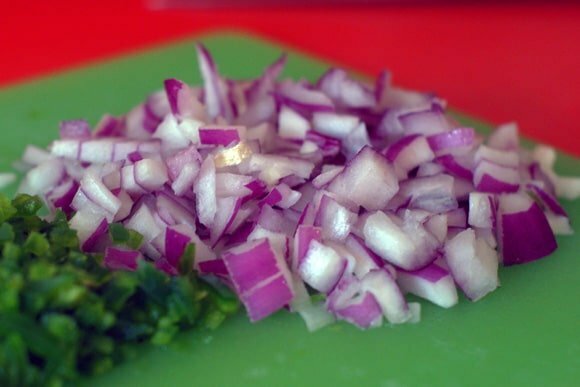 Heat a tablespoon of oil up in a medium sized sauce pan and add the onions and jalepeno. Cook until they are soft and starting to caramelize a bit. You’ll need some cheese. 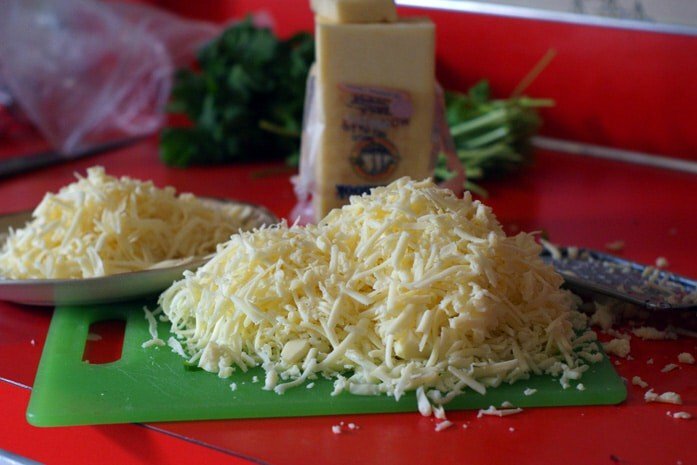 Cheese, oh glorious cheese. 2 kinds here: White American and Monterrey Jack. 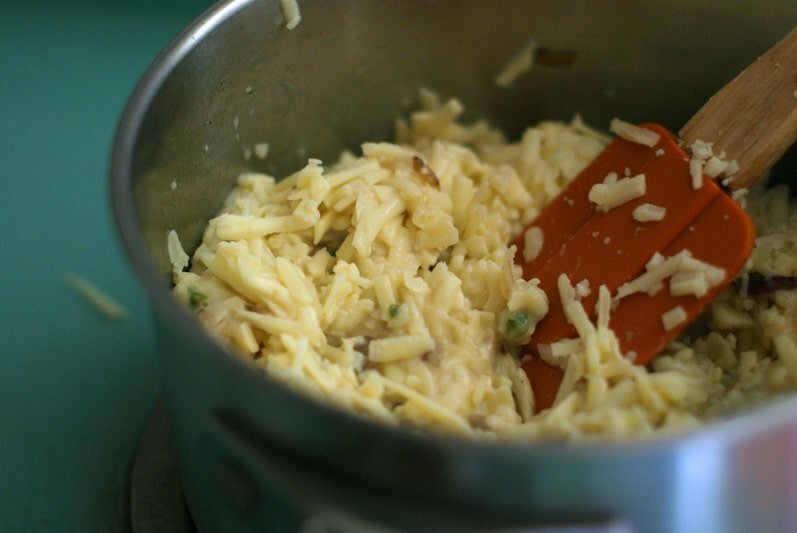 Add the cheese to the pepper and onion and stir away. It takes a few minutes but it will melt. Promise. Once its smooth and melted resist from putting your face directly into the pan and eating it all because it gets better. 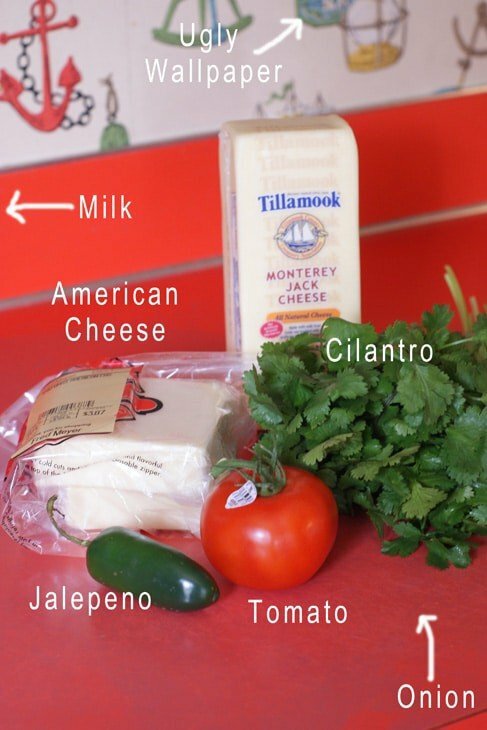 “How?” you ask… cilantro and tomatoes, that’s how. Hello dreamboat. Have any room for me? Don’t mind if I do… note that the hand pictured below is that of my 5 yr. old. She has great hands for, you know, a 5 year old, but I thought I’d let you know just in case you decided to judge me by my hands. Haters. 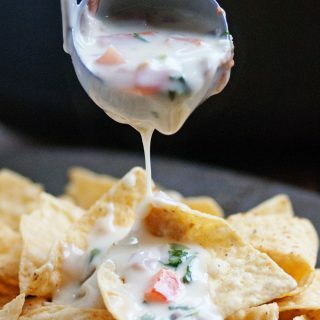 Want More Crazy Delicious Dip Recipes? Heat oil over medium high heat and cook jalepeno and onion until tender and starting to caramelize. Continue to stir until smooth adding milk until the desired consistency is reached. Stir in chopped tomatoes and cilantro. Serve hot with chips or tortillas. Reheats well over medium heat or in the microwave, stirring frequently. This sounds like such a good dip! Must-have for the holidays!! This recipe looks awesome! Perfect for weekend football or holiday parties!! Love the easy recipe! 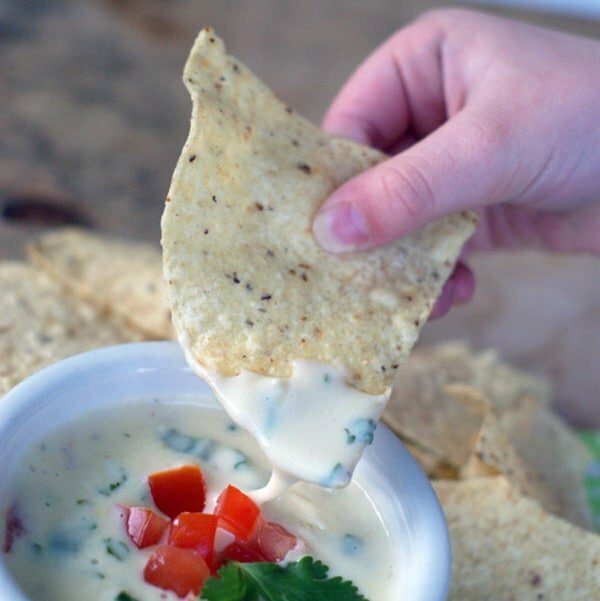 I could sit and eat chips and queso all day! Loving the new pics and the old ones too 🙂 So fun to go back and see how much you’ve learned! Cheesy, gooey goodness. This would be a huge hit at my house! 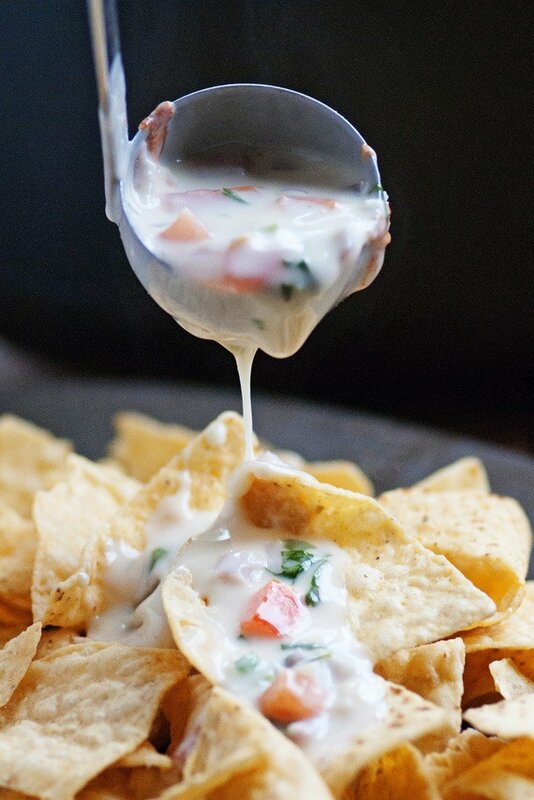 Queso is one of my favorites, I am totally making this! This is dangerous! I don’t need to know how to make this because I will make it all. the. time! I love seeing how far recipes have come and how well they hold up over time! Love the new pics, but I must say, those previous pictures are classic, lol. This is a dip I would love to try! Hi Heather, I just found you on SITS, and just wanted to stop in and show some blog love. I am loving the blog so far, can’t wait for more!!! I just decided to turn my blog into a baking/cooking/cake decorating blog of sorts (along with a few DIY’s and crafts every now and then. I’m glad I found your blog, and Happy Mother’s Day!!! Hi Ashley, thanks for stopping by!